In the IPO world, new biotech or consumer tech stocks get all the attention. The financial news keeps close track of how much a new tech IPO climbs the first few days after a public market launch. This makes great news bites, but it is hard for individual investors to participate. IPOs in the high-yield stock world get little or no attention. 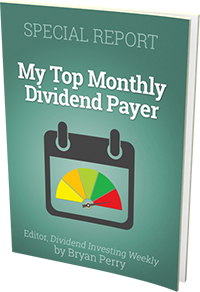 I make a point of finding and tracking new dividend stocks, and then recommending them to my subscribers when my analysis confirms attractive total return potential. One such stock has returned 50% since I made the first recommendation last Fall. The 2018 second quarter earnings show that the positive run still has plenty of room to grow. With a transformative acquisition in 2016, Arbor Realty Trust Inc. (NYSE: ABR) became a “new” company as far as investment potential. In July 2016 the REIT acquired privately held Arbor Commercial Mortgage, LLC. The acquisition diversified the company’s revenue stream, primarily by bringing in a larger commercial mortgage servicing portfolio. When well managed a portfolio of mortgage servicing assets can generate tremendous returns. 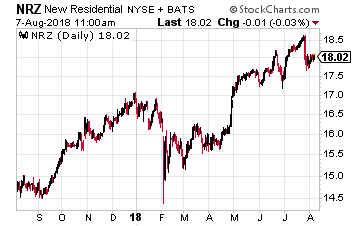 One of my long time recommendations, New Residential Investments (NYSE: NRZ) has generated a 100% plus total return over the last four years by focusing on residential mortgage servicing rights. Related: Is This the Best High-Yield Stock? The investment returns from ABR since mid-2016 have been spectacular. The quarterly dividend has grown 56% from $0.16 per share to the current $0.25 per share. The share price has appreciated by a comparable 60%. 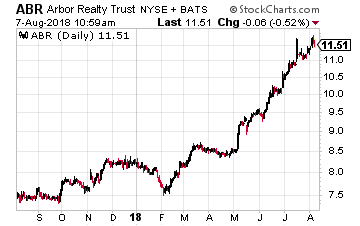 I first recommended this REIT to my Dividend Hunter subscribers in October 2017, and we caught most of the gains with the stock generating a 51% total return since that time.